DURING THE 1980s there were many prominent television series including Dallas, Dynasty, Cheers, The Cosby Show, Miami Vice, Who’s The Boss?, M*A*S*H, and The A-Team. Everyone wondered “Who shot JR?” and who would win a fight between Alexis and Krystle in the Carrington household. However another series that would take its place alongside the aforementioned iconic shows was one which took its inspiration from a 1980 film, directed by Alan Parker. In the mid-1980s producer David De Silva conceived and developed the television series around a group of students at the New York High School of Performing Arts. The adventures of Leroy, Coco, Bruno and Ralph as they auditioned for roles and eventually graduated towards stardom was followed by millions of viewers. In 1988 a stage version, Fame – The Musical, was premiered in Miami and had a successful run off-Broadway. The musical moved on to London’s West End and sold more than five million tickets during its run. Since then it has played to capacity venues across the world. Earlier this year RTÉ 1 launched a reality TV show to recruit lead singers for an Irish version of the popular musical. The winners of the series, Jessica Cervi and Ben Morris, now join former The Three Degrees lead singer Sheila Ferguson on an extensive nationwide tour which takes in Galway when Fame – The Musical comes to the Town Hall Theatre from November 2 to 7. The ‘Fame School’ in New York on which the movie, TV series, and musical is based has produced many illustrious alumni including Al Pacino, Robert De Niro, Liza Minnelli, Suzanne Vega, and Eartha Kitt. The institute still attracts many aspiring entertainment talents such as Madonna’s 13-year-old daughter Lourdes Ciccone Leon. Erica Gimpel was born into a showbiz family in Manhattan and graduated from the Lower East Side school in 1982. Inspired by Marvin Gaye, Stevie Wonder, Carol King, James Taylor, and Joni Mitchell, Erica developed her own songwriting and in her teens landed the role of Coco Hernandez in the Fame TV series. She also performed the opening theme from seasons one to four. In the late 1980s Erica left the series and began working on her career as a songwriter and actress. The ambitious New Yorker appeared in many movies and TV series such as Profiler, ER, Touched by an Angel, Boston Legal, and House. Gimpel and her friend Debbie Allen were nominated for an Emmy Award for the song ‘I Still Believe in Me’. Earlier this year Erica achieved a lifelong ambition when she released her debut album Spread Your Wings and Fly. Yet some of her fellow Fame cast members have not been so lucky since the series ended in 1987. Lead actor Gene Anthony Ray (who played Leroy Johnson ) died in 2003 at the age of 41 from complications of a stroke. Ray was also HIV positive. In 2008 Channel 4 screened Bring Back Fame which reunited original Fame cast members Gimpel, Lee Curreri (Bruno Martelli ), Valerie Landsburg (Doris Schwartz ), Carlo Imperato (Danny Amatullo ), and Debbie Allen (Lydia Grant ) alongside the mother of the late Gene Anthony Ray. Early this year RTÉ and Shinawil Entertainment recruited Erica to act as judge with actor Simon Delaney and producer Robert C Kelly to find Irish male and female stars for a nationwide tour of the Fame production. Erica told The Sunday Independent in May that “there is this strength, this power that exists here. I am seeing that in the talent, especially in their commitment to wanting to shine. I’m inspired.” Erica and the panel chose Jessica Cervi and Ben Norris as the winning talent. The Irish version of Fame – The Musical is directed by Brian Flynn and is choreographed by Gary Lloyd of X Factor Live and features costumes and sets from the West End productions. 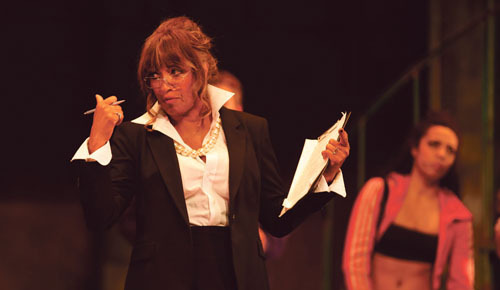 American soul singer Sheila Ferguson of The Three Degrees plays the part of Miss Sherman in the show. “I’ve never seen the movie, the TV show, or the musical so I come to role very fresh,” she says “What I’m bringing to the show is my own adaptation of Miss Sherman and how I see her role in that school/show. Ferguson began her new role at Dublin’s Grand Canal Theatre in August and has travelled with the show to Castlebar, Belfast, Cork, Derry, Killarney, and Limerick.